In what has become an annual event, the Washington Slurs have ended the competitive portion of their season. Sure, there’s another games to go, but with a 3-7 record, there’s no realistic scenario that gets the Slurs into the playoffs. So, the Washington coaching staff and front office will surely go into player evaluation mode to see what they have to build upon. Their most important evaluation will be at quarterback. 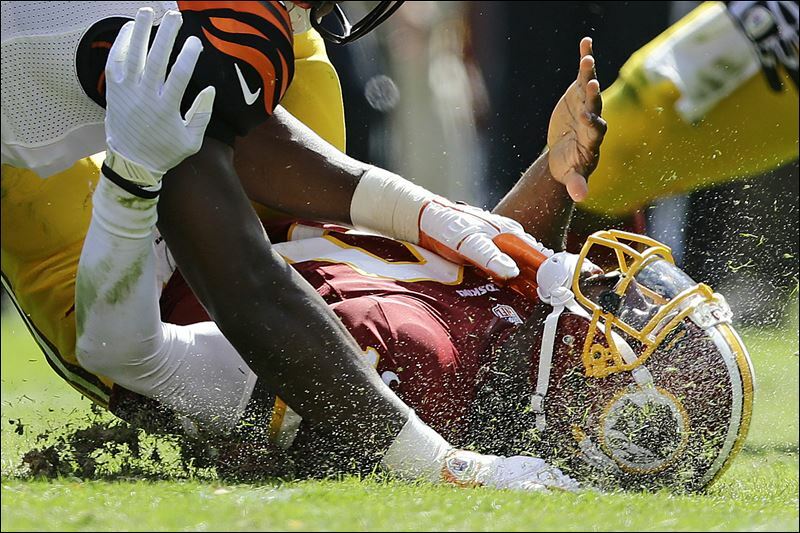 Three years ago, the franchise paid a heavy price to acquire Robert Griffin III, and even the most ardent of Griffin supporters would have to agree that major improvement is necessary. While the knee-jerk reaction from fans (judging by Twitter commentary, office chit-chat, and sports radio callers) is that Washington should move on from Griffin. The verdict: he’s shown he’s not an NFL-caliber QB. He doesn’t read defenses well enough, and when he does try to run, he seems to be missing that world-class sprinter speed he exhibited before the wrecked knee and the dislocated ankle. To me, what makes the most sense is to ride out the season with Griffin and see if he’s able to learn and improve. While Griffin had a tough game against the pitiful Buccaneers, backups Colt McCoy and Kirk Cousins each performed worse when given extended chances to play. McCoy did have a good game a few weeks ago, but was dismal as the starter in Cleveland. Cousins may have potential, but had a tendency to throw the ball to the other team. I don’t see a ton of reason to play McCoy or Cousins, barring an injury or a catastrophic meltdown. Griffin looks like a guy who needs experience, which he won’t get by standing on the sideline. If he doesn’t show improvement, I’d lean toward picking up that fifth year option, and then holding an open competition for the QB job. But, before diving headfirst into the wreckage of the future, it’s worth a look at how Griffin compares to other QBs at a similar point in their respective careers. In his third season, and with 32 starts, Griffin is obviously struggling. My search through the historical record suggests that’s actually pretty normal for young QBs. Notable players falling just outside the top 20: Andy Dalton (21st), Donovan McNabb (23), Andrew Luck (26), Michael Vick (32), Drew Brees (38), Eli Manning (44), Vince Young (55), Trent Dilfer (58), and Alex Smith (60). At least a few of those guys seemed to turn out okay in the long run. However, recall that Griffin’s rookie season was one of the best ever. His Rate+ was 122, which tied with Roethlisberger for second best all-time behind Dan Marino’s 125. He obviously hasn’t performed to that level the past two seasons. The more “normal” progression is for young QBs to improve as they gain experience. Griffin was great immediately, but then played worse. It begs the question…What happens if we look ONLY at second and third seasons? To answer that question, I pinged PFR’s database to find QBs who started at least 15 games in their second and third seasons (Griffin has 17 starts so far in his second and third seasons). As a rookie, Griffin’s Rate+ was 122, which is outstanding. For his full career, it’s 106 (a bit above average). But for the past two seasons, it’s 95, which is a little below average. This suggests Griffin isn’t playing catastrophically bad (which he’s sometimes accused of doing), but it’s also clear he’s nowhere near the offensive force the Slurs need him to be. Among the 67 QBs with at least 15 starts in their second and third seasons (since 1995), Griffin ranks 39th in Rate+. At the top of the list are a virtual who’s-who of good-to-great QBs. Kurt Warner tops the list. Peyton Manning landed fourth. Russell Wilson — selected 73 picks after Griffin — ranks 11th. Tom Brady is 12th. Players in the “about the same” grouping with Griffin include names like: David Carr, Shaun King, Gus Frerotte, J.P. Losman, Kyle Orton, Derek Anderson, Eli Manning,and Patrick Ramsey. Guys who rated worse, but became good QBs later include Drew Brees (51st), Alex Smith (63rd), Drew Bledsoe (65th) and (kinda-sorta) Trent Dilfer (67th). Probably the most hopeful scenario for Griffin is the Ben Roethlisberger story, but that narrative is different. Roethlisberger was terrific as a rookie, and followed it up with an outstanding second season. His third season was rough, but he bounced back in year four and has been a solid-to-excellent QB since. Griffin, of course, had a great rookie season, a MAJOR drop-off in year two, and a modest recovery in year three (so far). Unless Griffin can find a way to improve, he’s far more likely to be someone’s backup in the near future than to be the franchise bedrock the Slurs were hoping he’d be.